Kidneys are important to our wellbeing, looking after our bodies through the production of urine to get rid of excess water and toxins. Acute kidney injury is a sudden and recent reduction in a person’s kidney function. It is not caused as a result of a physical blow to the body. 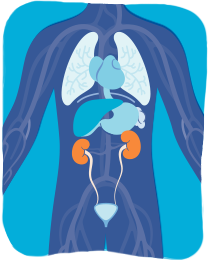 Think Kidneys is the NHS’s campaign programme for tackling acute kidney injury. Our aims are to reduce avoidable harm and death for people with acute kidney injury, and to improve care for patients whether in hospital or at home. These case studies have been written for health and care professionals to increase understanding and aid learning.